In this meditation and yoga retreat, Adiwana Resort Jembawan will provide you a personalized assistance at every step by customizing activities and cultural experiences in accordance with individual requirements of your group. This personalized retreat will be more than just pampering experiences. It has been designed with your individual needs in mind to help you reconnect, reflect on overall well-being, unplug and escape your day-to-day demands. Adiwana Resort Jembawan is a boutique wellness retreat in the heart of Ubud that focuses on body, mind and spirit rejuvenation. With its team of onsite experts including an Ayurvedic practitioner and yoga instructor, the resort offers lifestyle programs that are tailored to address specific health concerns. This 37-room property is a healing sanctuary for personal renewal with affordable solutions to many of the issues caused by trying to exist in today’s fast-paced world. It is a place where guests are encouraged to slow down, eat nutritious food and return to the basics of simply living well. Adiwana Resort Jembawan's facilities include non-smoking rooms, room service, Herb Library, Tejas spa, two swimming pools, yoga pavilion, airport transfers, bicycles, free Wi-Fi in all areas and parking. Moreover, the room facilities include air conditioner, fan ceiling, coffee and tea making facilities, mini bar, laundry service, safety deposit box, cable TV (international and local channels), IDD telephone, slippers and kimonos, hair dryer, iron (on request) as well as turn down service. Tejas Spa at Adiwana Resort Jembawan has been inspired by the holistic teachings of Ayurveda, which is the world’s oldest healing system that originated in India. This age-old concept is evident in the spa’s therapeutic menu as well as its rich interior design. It encompasses a combination of treatment rooms for wet and dry therapies, along with steam boxes, a crystal light bed, and Thai massage room. An Ayurvedic practitioner presides over this unique wellness facility to conduct pre-treatment consultations and suggest integrated health programs. Tejas Spa’s menu places great emphasis on balancing all areas of life and helping the body call upon its own energy to heal. Open daily from 9 a.m. to 10 p.m.
Adiwana Resort Jembawan offers a choice of two swimming pools surrounded by traditional landscaping by Made Wijaya, Bali’s very own authority on tropical gardens. Both pools have been created with early morning laps and water-based exercises in mind. There’s also ample space for daytime relaxation with a collection of reclining chairs and shady umbrellas. A Yoga pavilion is located in a strategic spot around the resort. It has its own unique energy and serene ambiance where guests can exercise or meditate under the expert guidance of our resident instructor. Daily sessions of yoga, combining stretching movements and deep breathing, complement all of the wellness programs on offer at Adiwana Resort Jembawan. The Deluxe Room provides a restful environment to unwind after a busy day spent exploring the sights of Ubud. It is a cozy base featuring clean-line furnishings, a smart en-suite bathroom and a decorative wall that showcases Bali’s creative legacy. A private terrace or balcony blends seamlessly into the outdoors providing extra space to sit and relax. The Deluxe Room has 24 rooms available that have 17 double beds and seven twin beds with a two-set connecting room. The Adiwana Room is the resort’s signature accommodation category that ensures total comfort and holiday peace of mind. It features a smart decor with an original work of local art extending along one entire wall and out onto the terrace. An elegant bathroom with a rain-shower cubicle and a floor standing bathtub promises spa-styled bathing indulgence. The Adiwana Room has 12 rooms available that have ten double beds and two twin beds with a two-set connecting room. The wellness resort is designed to offer the ideal setting and facilities to host retreats. Adiwana Resort Jembawan provides personalized assistance at every step by customizing activities and cultural experiences in accordance with the individual requirements of your group. The teams have created a choice of personalized packages which are more than just pampering experiences. Each package has been designed with your individual needs in mind to help you reconnect, reflect on overall well-being, unplug, and escape day-to-day demands. This will be achieved by blending spa services, mindfulness activities, cultural excursions, and healthy lifestyle practices with plant-based cuisine and consultations with an Ayurvedic practitioner. 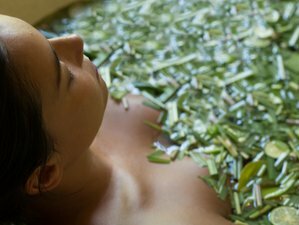 The Ayurvedic practitioner will recommend and customize a program that may include a detailed relaxation, rejuvenation, detoxification, and wellness schedule. Yoga and meditation are available based on your constitution. You will have three cultural excursions during this meditation and yoga retreat. Adi Gunawan is Balinese Yogis Yoga Master. He is an Ashtanga and Hatha yoga teacher, yoga specialist, and Meditation practitioner. Adi is passionate about empowering and encouraging people to live in harmony with the rhythms of nature through the time-honored teachings of yoga, Ayurveda, and mindfulness. During this retreat, you will practice yoga and meditate at Adiwana Resort Jembawan in Ubud, Bali, Indonesia. During this retreat, you will be served daily meals breakfasts, lunches, and dinners which include standard beverages. Daily two bottles of mineral water, afternoon tea, and fruit basket will also be provided. Upon your arrival, you will get a welcome drink from Adiwana Resort Jembawan. Herb Library is a contemporary healthy dining venue located at the front entrance of Adiwana Resort Jembawan. The restaurant will not be serving purely raw or ‘living’ food but offering a rather different plant-based all-day dining menu for herbivores with sustainably and responsibly sourced fish and chicken options for omnivores. This is a carefully crafted and nutritionally balanced and multi-culturally influenced cuisine that uses local as well as seasonal ingredients. The Herb Library opens daily from 7 a.m. to 11 p.m. The most important thing for Adiwana Resort Jembawan is that the diners realize their food is created by people who really care about what they put on the plate. Adiwana Resort Jembawan uses carefully sourced, sustainably grown vegetables and salads from Bali's central mountains to create appealing, healthy and satisfying dishes while constantly experimenting with local flavors, ingredients as well as raising standards. The most important ingredients on Adiwana Resort Jembawan's menu are the herbs themselves. Lots and lots of them will create unusual levels of taste. What makes the menu at Adiwana Resort Jembawan's Herb Library is different from other restaurants is not one of the dishes are deep fried. Everything is quick, freshly and lovingly made to order and Adiwana Resort Jembawan hopes that the menu is interesting enough to inspire diners to experiment and try the new flavors they offer. "Eggs-traordinary Sweet" or "Eggs-traordinary Savoury" all day dining, together with "Coolest Salads", "Wonderful Wokstars and Bowled Over by the World" are just some of the headings for novel dishes that Adiwana Resort Jembawan offers. A complete Ayurvedic menu will be available for the resort guests after a consultation with the Indian in-house practitioner Mr. Suresh. Adiwana Resort Jembawan's Herb Library was created because Adiwana Resort Jembawan wanted to be innovative and present a different concept to add to the many alternatives already available in Ubud. Adiwana Resort Jembawan would like to offer food with respect for the environment as well as the guests who should think about and appreciate what they are putting into their bodies in the way of nourishment. This means that Adiwana Resort Jembawan tries very hard to only to buy local products so that they can cut down the carbon "footprint" for imported ingredients, support small local producers through contacts to villagers as well as experiment with interesting flavors using little known or nearly forgotten herbs and leaves. "Take me to your room"
For your convenience, Adiwana Resort Jembawan is delighted to offer in-room dining options which they call “take me to your room”. You can enjoy a selection of healthy snacks, light bites, freshly prepared dishes as well as fruit and vegetable juices in the comfort and privacy of your room. Prepared from locally produced and freshly sourced ingredients, all dishes are delivered to your room in a hamper. In this retreat, you will get 36 Ayurvedic and spa treatments. The choice of treatment applies based on the consultation. Ayurvedic treatment will be available from 9 a.m. to 10 p.m. Tejas Spa at Adiwana Resort Jembawan has been inspired by the holistic teachings of Ayurveda which are the world’s oldest healing system that originated in India. This age-old concept is evident in the spa’s therapeutic menu as well as its rich interior design. It encompasses a combination of treatment rooms for wet and dry therapies along with steam boxes, a crystal light bed, and Thai massage room. An Ayurvedic practitioner presides over this unique wellness facility to conduct pre-treatment consultations and suggest integrated health programs. Tejas Spa’s menu places great emphasis on balancing all areas of life and helping the body call upon its own energy to heal. The spa is open daily from 9 a.m. to 10 p.m. Please book your flight to arrive at Ngurah Rai International Airport (DPS). Transfer from and to the airport is included. Adiwana Resort Jembawan will pick you up from the airport. Adiwana Resort Jembawan is a wellness resort designed to offer the ideal setting and facilities to host retreats such as wellness and yoga retreat. Cancellation made within 14 days of arrival will be charged 50% of the total due.